Something evil has infected the master power battery on Mogo. I suppose if one thinks of it as an Internet hub, and all the power rings as terminals hooked into the network, then the GLs have a rather nasty virus. It’s sentient, giving conflicting orders to individual Lanterns and crafting an atmosphere of confusion and distrust. All this after killing a Guardian and severely injuring Corps leader John Stewart. This reinforces my biggest grievance regarding the Green Lantern titles – that each seems to take place in its own continuity. Currently, in Hal Jordan and the Green Lantern Corps, they are fighting the Darkstars, but Simon and Jessica are nowhere to be found. They’re excluded from the war. The current story arc in Green Lanterns features the Corps as a whole, as well it should if the central power battery has been infected. 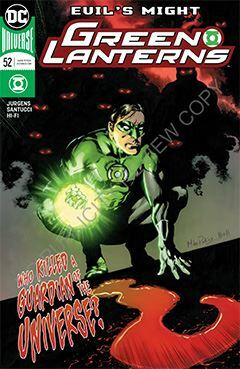 This issue, Hal Jordan makes a comment regarding the “recent” Darkstar conflict, making it clear that one storyline precedes the other. In which case, I’d much rather DC not publish them concurrently. For a company that has done so much to generate connective tissue among its titles, this just weakens the connection between the titles. What impressed me about this particular chapter is the artwork of Marco Santucci. I’ve made no secret that I’m a big fan of Bronze Age comics, and Santucci’s work reminds me of a blend of Jim Sherman, Mike Nasser and Terry Austin. Further reinforcing the Bronze Age connection is the conflict with the Ravagers. Their last battle with Hal Jordan was way back in the Flash #237-243, c. 1975. So reading this issue made me feel like I was back in the 1970s, enjoying the comics I read as a kid.